que in aureis operibus sudat. ubi ilia in preciosissimas gemmas convertis. the mind serves as the bond. by their own works and deeds. transforming them into most precious gems. and to direct us on the righteous course. Hildegard’s unique contribution in this hymn is to interpret the “sound…like the rush of a mighty wind” as music, the heavenly symphony whose harmony expresses the perfection of God’s creativity. 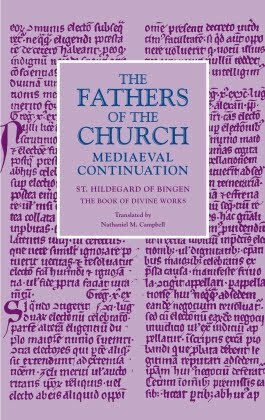 As I have explained elsewhere, for Hildegard, the Word of God doesn’t just speak—he sings; and thus, when we express ourselves in music, we share almost sacramentally in the symphonic divine grace, whose musician here is the Holy Spirit. As Hildegard described to the prelates at Mainz in a letter from the last year of her life, Adam sang with the voice of angels in paradise, but lost the “sweetness of all musical harmony” in the Fall. That fallenness, and the Holy Spirit’s role in bringing us back from it, forms the subject matter of this hymn’s central verses. As Peter Dronke has noted, however, this meditation “on the nature and motivation of human evil” contains “certain overtones of the dominant opening images, fire and music”: both the lamplight of the will (verse 3) and the scorching refiner’s fire burning away the dross of evil (verse 8); and both the sweet music of the intellect’s call upon the Spirit (verse 4) and the Spirit’s swift movements to constrain the wandering soul, as drawing across the lyre’s strings and beating upon the tympanum’s drum (verse 9). The next seven verses follow the ups and downs of this once-inspired soul, tempted and pulled to wander away. The building-up of the Spirit within the soul is contrasted in verse eight with the soul’s selfish desire to build itself up—and because such a puffed-up pride is hollow and without foundation, it ultimately falls flat (v. 9). The imagery of the building itself returns with force in verses eleven and twelve, as Hildegard contrasts the prideful tower of the Devil, torn down by the Holy Spirit and cast into Hell, with the tower of contrition and virtue that the Spirit raises in its place amongst those who repent. The tower of pride is not the only image, however, that Hildegard uses here to illustrate the source of prideful temptation. In verses five and six, she draws on the imagery of her vision of the Fall in the first part of the Scivias (Vision 2): the nebula is the shadowy, misty cloud, the loathsome form the Devil took when he reached out from the smoky pit of Hell to enwrap and infect the candida nubes (bright white cloud) of Eve, the mother of the human race. The mind that the Spirit set ablaze in the human soul in the second verse is supposed to restrain the will and desire from wandering off into this evil land of shadows and dust, as Hildegard tells us in verse seven. But the allure of sin proves too much, and so the Holy Spirit must provide the constraint, drawing the soul back to goodness through the ordeals of the human experience. What starts as simile in the prose text of Scivias gives way to the unmediated mixture of metaphor in the poetry of this hymn. When the Holy Spirit transforms the faithful into the shining gems that adorn the City of God, it also directs them into the paths of righteousness. There, they journey together, built up in the tower of the Holy Spirit which serves to strengthen the Church—the tower that appears in both this hymn and in the aforementioned vision in Scivias, and is illustrated above. As with Hildegard’s first antiphon to the Holy Spirit, Spiritus Sanctus vivificans vita, this hymn unites a paradoxical set of images: the firm stability of the tower with the purposed movement of a journey towards righteousness. Fundamentally, the gift of the Holy Spirit to the Christian is to grow strong, not relying on the empty foundations of pride, but strengthened and confirmed in the faith.